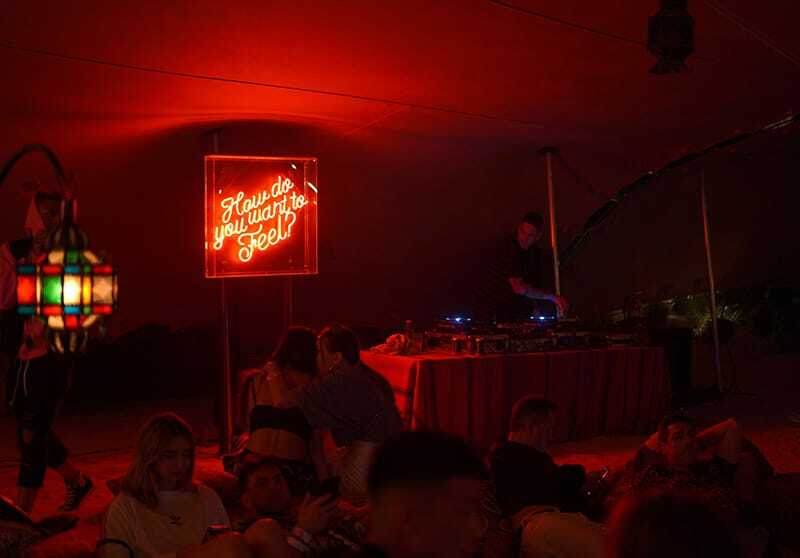 Goldenvoice turns up the heat with its first official Coachella festival after-party at the Zenyara estate. 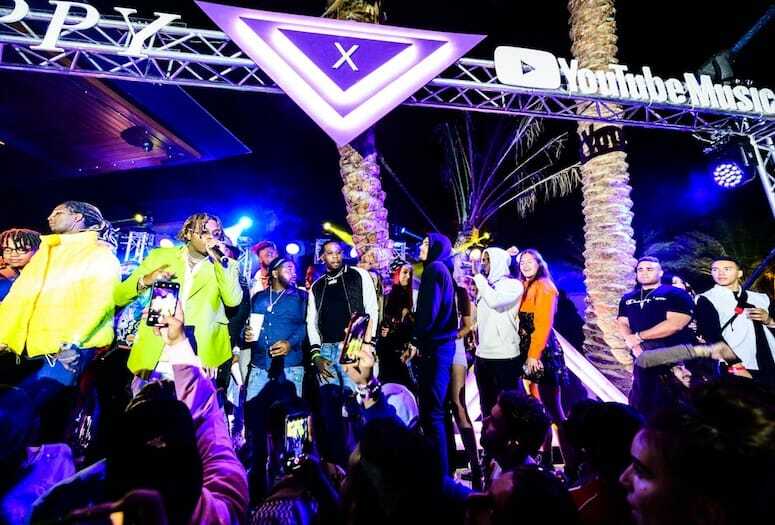 Gunna performed on the YouTube Music Stage at the “Poppy x Google Midnight Bloom” event at the Zenyara estate in Coachella, Friday, April 12, 2019. Why fight festival crowds when you can turn up with celebrities like Pusha T, Diplo, and Idris Elba at private estate parties with open bars and unobstructed stages? These Coachella Valley Music and Arts Festival spinoff events (mini fests in their own right) are totally free — if you secure a coveted invite. This year’s VIP party calendar introduced a new weekendlong gathering that rivaled reigning guest list–only fixtures such as Revolve Festival, Neon Carnival, and the McDonald’s/Bootsy Bellows bash: For the first time, festival producer Goldenvoice hosted its own off-site programming in partnership with the branding gurus at Corso Agency. The exclusive day-to-night festivities held at the Zenyara estate in Coachella happened during Weekend 1, April 12–14, and will return for Weekend 2, April 19–21. The venue, a 37-acre compound valued by Zillow at more than $76.6 million, spreads out around a central Bali-inspired lake with a sprawling white-sand beach, multiple outdoor bars (with homespun swings in place of stools), a Clive Clark–designed golf course, a helicopter pad, a regulation basketball court with stadium seating, and just about every other amenity one could possibly dream up. Yes, peacocks even announce your arrival as you pass through the guarded entry gates. Photographer Mark Hunter, aka Cobra Snake, made a splash at the Adidas Sport Club action at the Zenyara estate, Friday, April 12, 2019. Celebrity chef Eddie Huang and footballer Von Miller prepared barbecue bites for Adidas Sport Club at Zenyara, Friday, April 12, 2019. Friday afternoon started with the debut of Adidas Sport Club, the culmination of brand founder Adi Dassler’s vision to bring together leaders of sport and culture for one big party. Celebrity chef Eddie Huang and Super Bowl 50 MVP Von Miller hosted a Caribbean-style barbecue while a basketball shootout with NBA players raged on the courts; Pusha T surprised with a courtside performance. Also in attendance: Chargers wide receiver Keenan Allen, Sparks forward Candace Parker, and rapper A$AP Ferg. After dusk, neon lights and laser beams danced above the water, and the “Poppy x Google Midnight Bloom” party continued late into the night with A-list turnout — Cuba Gooding Jr., Leonardo DiCaprio, Gigi Hadid, Wiz Khalifa, and Winnie Harlow among the revelers — with a headlining performance by Gunna and additional programming curated by The h.wood Group. GALLERY: View additional images from Weekend 1 at the Zenyara estate. Saturday’s hush-hush daytime affair, dubbed the “You Had to Be There Party,” required attendees turn over cell phones and cameras upon entry and surrender to the otherworldly experience instead. The spectacle included synchronized swimming and water-jetpack acrobatics, skydivers, and performances by A-Trak and Diplo on the intimate outdoor stage. Lines to get in grew as festival headliners wrapped for the night, and Zenyara’s “Art of the Wild” party, presented by Framework and Wynn Nightlife, quickly reached capacity. An hour after finishing his set in Coachella’s Yuma tent, actor-turned-DJ Idris Elba (Luther, Beasts of No Nation, Thor) took the Zenyara stage — the difference being this crowd actually had room to dance. 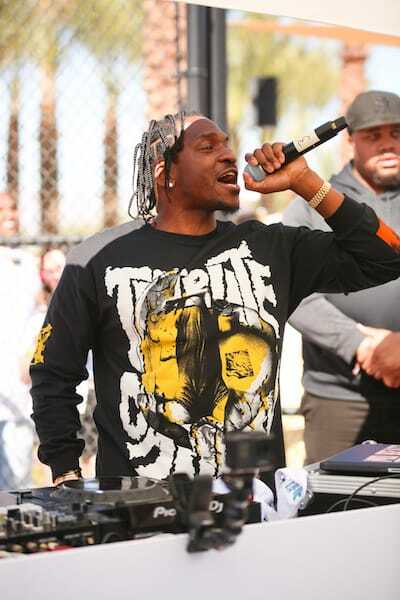 Award-winning rapper and record producer Pusha T surprised guests with a performance at Zenyara’s basketball court following a three-point shootout with NBA stars, Friday, April 12, 2019. The “You Had to Be There Party” at Zenyara featured jetpack stunts and other water spectacles on the lake, Saturday, April 13, 2019. 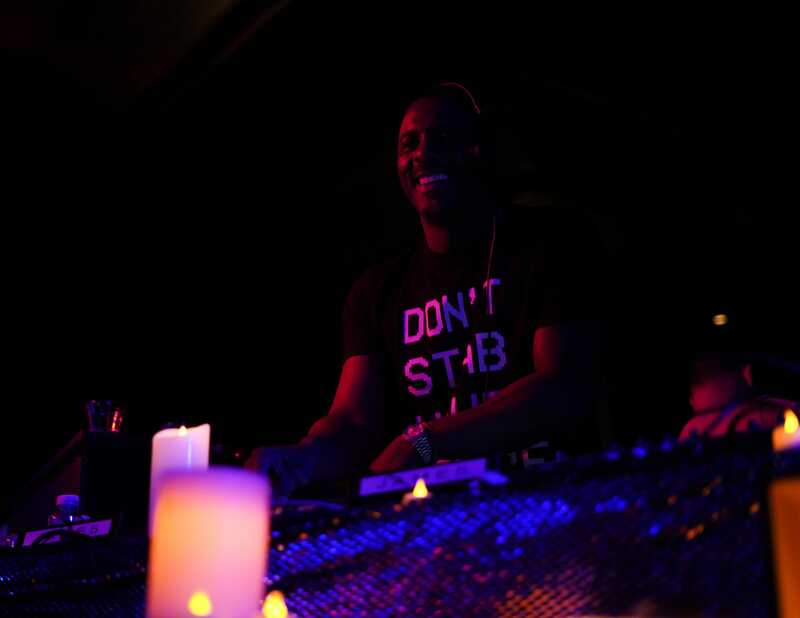 Idris Elba DJed at Framework and Wynn Nightlife’s “Art of the Wild” party at Zenyara, Saturday, April 13, 2019. Sunday allowed for more game time and a gradual start to Weekend 1’s final festival day. Then came the after-party to end all others, with thousands of who’s-who invitees in attendance for “Rumors Palm Springs” (sponsored by Framework and Wynn Nightlife), with performances by Blond:ish, DJ Seinfeld, Kaz James, and Guy Gerber. The private weekend event included activations by the Desert Hot Springs–based cannabis brand Canndescent, which gifted guests with pre-rolls and other products inside a Moroccan-inspired, tented lounge area on the beach; Rolls-Royce provided stretch-limo service and put cars on display throughout the property; Ambros Banana Whiskey served boozy craft cocktails; Red Bull, Heineken, beverage company Pernod Ricard, cosmetics brand Urban Decay, and the marijuana delivery service Eaze also had presence at the event. Revelers chilled on floor pillows while listening to the DJ and enjoying samples from cannabis brand Canndescent in a tented lounge area set up on Zenyara’s beach, Saturday, April 13, 2019. Coachella Weekend 1 may be over, but Goldenvoice’s month of music is just getting started. Expect additional surprises at Zenyara during Weekend 2, beginning at noon, Friday, April 19. Read next: Music Festival Tips From Coachella and Stagecoach Performers.